If you are trying to include the night of September 13 in your reservation, you will get a message saying that the hotel is sold out. Please note that all other nights are available at the conference hotel. If you need a sleeping room on the night of September 13, you may be able to make a second reservation for that room only. 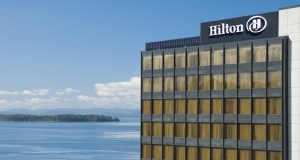 The Burlington Hilton Hotel is situated on the waterfront and offers expansive views of the scenic Lake Champlain and the picturesque Adirondacks. The hotel can be reached at: 1-802-658-6500. We have reserved a block of rooms at The Burlington Hilton under the name “Best Practices 2017.” Mention that you are a Best Practices 2017 attendee to receive a discounted room rate of $175/night. The hotel will honor this rate until August 21, 2017. To make reservations online, Click here!